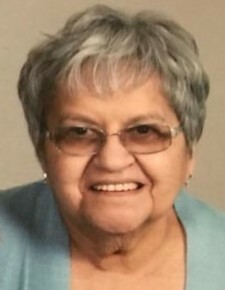 Hope East, 84, Kokomo, passed away at 12:42 p.m. on Friday, February 8, 2019, at her home surrounded by her loving family and friends. She was born December 31, 1934 in East Chicago, Indiana, to Francisco & Antonia (Garcia) Hernandez. She was loved and raised by Petra & Estaban Diaz. On May 6, 1955, she married Jerry W. East, in Crown Point, Indiana. He preceded her in death May 26, 2018. Hope was a member of St. Joan of Arc Catholic Church and was active in the Texas Migrant Council and as a Girl Scout troop leader. She enjoyed sewing, camping and traveling with her family, especially her trips to Canada and Mexico. Hope is survived by her children, Cynthia Bizjak and her husband Steven, Renee Ripberger, and Rochelle Kinney; grandchildren, Jason Bizjak and his wife Jenny Fawbush, Ft. Wayne, Joseph Bizjak, Pleasant Ridge, Michigan, Mary Elizabeth Kinney, Kokomo, and Patrick Kinney, Broad Ripple; great-grandchildren, Luke Fawbush and Maxwell Jerry Bizjak; sister, Sonia Sanchez; brother, Raymond Franco; sister–in-law, Judy East; along with several nieces and nephews. She was preceded in death by her parents; her adopted parents who raised her; her sister Connie Prieto and son-in-law, Richard Ripberger. A Mass of Christian Burial will be celebrated at 4:00 p.m. Wednesday February 13, 2019 at St. Joan of Arc Catholic Church, 3155 S. 200 W., Kokomo. Burial will take place at a later date in Albright Cemetery. Friends are invited to visit with the family from 2:00 - 4:00 pm Wednesday at the church. Shirley & Stout Funeral Home & Crematory has been entrusted with arrangements. In lieu of flowers, memorial contributions may be made in Hope’s memory to Indy Honor Flight, PO Box 10, Plainfield, IN 46168, or to Premier Hospice, 2529 Commerce Dr., Suite A, Kokomo, IN 46902. Messages of condolence can be left online at www.shirleyandstout.com.